About Bryan Ward: "My time is spent drawing, painting and being a single parent to my lovely daughter, I also find inspiration in traveling and spending as much time in nature as possible. I've been creating visual art since I can remember. Having been influenced by the Surrealists and the discovery of Entheogens at a young age, my art has always reflected the strange and the weird, the fantastic and visionary. At times reflecting the macabre and my darker side and other times exploring my fascination with the unknowable and the awe and bliss of being alive. My work obviously has meaning for me and my personal myth comes through either consciously or unconsciously; as for any absolute meaning in my work though I think the power of visual art is that it's open to the individual's interpretation. Question what you see, consider what you don't, draw your own conclusions. The Snake that Giveth Knowledge, Delight, Bright Glory, and Stirs the Hearts of Men. I created this as a subversion of the Paradise Lost story. 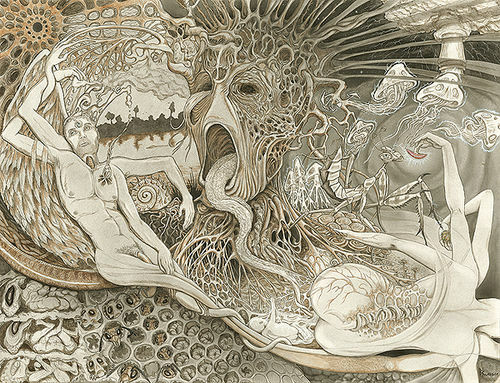 Adam and Eve in the Garden of Eden, partaking of the forbidden fruit from the tree of knowledge, the fruit being one of the many Enthogenic plants (ayahuasca, peyote, amanita, psilocybin mushrooms) represented in the painting. These plants share nature’s wisdom of being one with the universe, in all of its possibilities, in our glory and failings, and the responsibility of free will in our lives and on the planet. 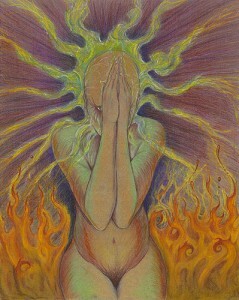 The title is a partial quote taken from William Blake's Marriage of Heaven & Hell. 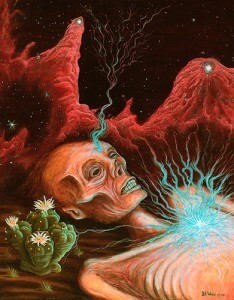 At the moment of deaths release, does our energy transform into the universe, and thus we live eternally in the heavens? 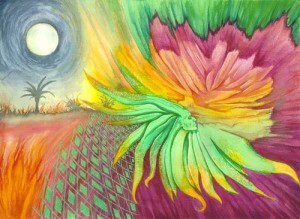 Coming directly from a vision I had during an experience with ayahuasca. Sometimes these "visions" are as clear as a waking lucid dream; this was one of those times. 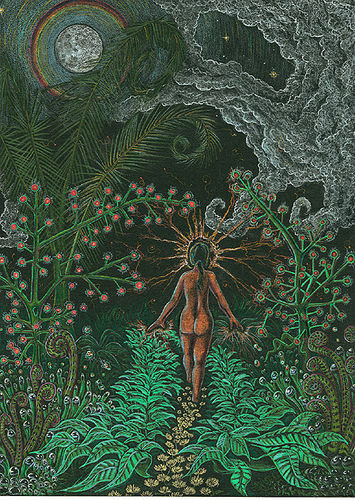 I sensed the woman was the spirit of the vine, madre (mother) ayahuasca, bidding me to follow her into the jungle of the unknown in search of divine knowledge. 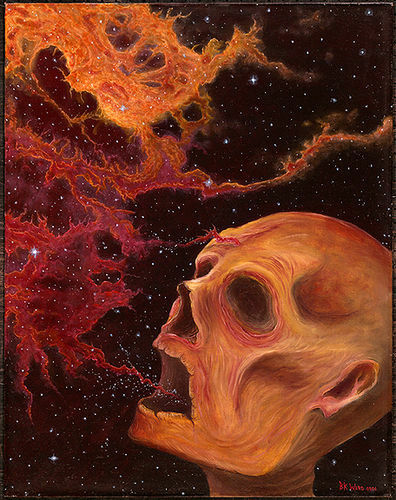 This represents the possibility of the transference of energy into the universe upon death of the physical body, the soul melding with the gaseous nebula's creation of new planets. This was painted the morning after an ayahuasca ceremony with the vision inducing brew from the Amazon jungle. 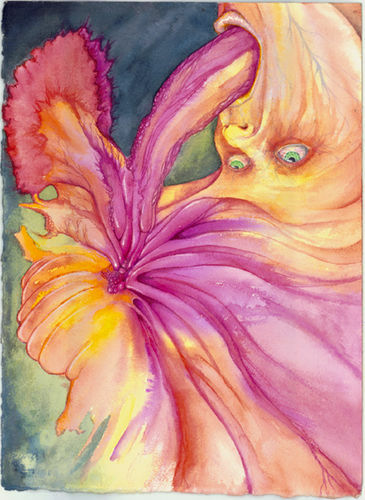 It started as a spontaneous watercolor and morphed into a representation of la purga (the purge or vomiting after drinking the vine), with an organism coming from the mouth and transforming from flesh to flower. Many times during ayahuasca ceremonies there is the sensation of not only communicating with a serpent but that it is literally inside of me cleaning me out. 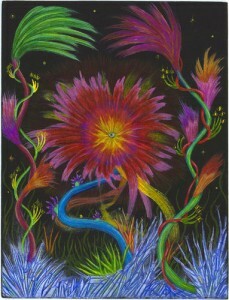 Inspired by the amazing plant life and flowers in the Amazon and the influence these plants have on these alien crystalline visions while under the influence of Ayahuasca. I started painting this before my first trip to South America to experience the plant medicine ayahuasca. 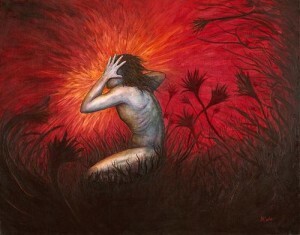 I had some fear and apprehension which obviously shows itself in this painting, ultimately the experiences where positive and life changing but not without some very personal work and hardships. The elements coming through in a female spirits prayer. Here is another morning after piece, with the brew still working its way through my body. I let the subconscious come through with no specific meaning or interpretation.